Haven’t decided on a hotel yet? 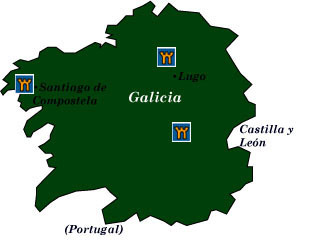 You can look at other available hotels in the Galicia region with Booking.com. Wild and windswept, mystic and misty, Spain’s most remote region is land’s end. In medieval times, Europeans believed that this was the end of the earth. Nothing existed beyond. Bordered by the Atlantic on two sides, the Galician coast is sliced by fjord-like rías, its rocky headlands thrust into the sea. It’s also Spain’s rainiest region, as the verdant green hillsides can attest. Much of Galician culture looks to the north. The Celts arrived here in 1000 B.C., living in castros, villages of stone huts with defensive walls. And even today, an almost medieval quality exists in areas with tiny farms still worked by oxen and horses. If any image symbolizes Galicia the most, it is that of the scallop shell, a tribute to the patron saint of Spain, the apostle James, or Santiago. They are everywhere: on signs and embedded in streets. Real shells are worn around the neck of thousands of pilgrims en route to Christendom’s third greatest pilgrimage site: Santiago de Compostela. Santiago de Compostela The third most important Christian pilgrimage destination in the Middle Ages after Jerusalem and Rome, for over a 1000 years pilgrims have trod the back roads of Europe and across northern Spain with the goal of reaching the cathedral of Santiago, thought to hold the remains of the apostle St. James. Today, the Camino de Santiago is as popular as ever. Magic exudes from the inspirational cathedral, the winding medieval streets, and the wonderful historic buildings of this glorious city. A Coruña In Galicia’s large and busy port city, stroll the Dársena de la Marina, the longest seaside promenade in Europe. Fishermen’s houses are enclosed in glass to protect them against the fierce storms that often pound the coast. Inside the 16th-century Castillo de San Antón, the Museum of Archaeology exhibits relics of Galicia’s Celtic past. The Torre de Hercules is the oldest functioning lighthouse in the world, initially built in AD 98 during the reign of Roman emperor Trajan. A Coruña’s moment of history came when the ill-fated armada of Philip II set off from here in a disastrous attempt to defeat the English. Pontevedra This typical Galician town lies at the head of a long ría and is a delightful place to wander about enjoying the flower-filled balconies, cobblestone streets, and small arcaded squares. Its Museo Provincial, housed in two 18th-century mansions, presents Bronze Age exhibits, Celtic jewelry, and Renaissance paintings. Rías Baixas A number of fjordlike inlets mark this area of lovely scenery, some resort towns, and long stretches of unspoiled coastline. Fortified Roman-Celtic villages, hórreos, pazos, and dolmens (a type of prehistoric tomb) provide the backdrop. Cabo Finisterre “Where the land ends,” with its splendid views, cape, and lighthouse, lies on the westernmost point of Europe.